One of my favorite living addresses is Alaska! I spent over a year stomping along trails, hiking into the deep tundra, beachcombing the shorelines, exploring it’s wilderness, nourishing my love for nature’s wildlife, climbing enormous mountains, slipping down glaciers and taking dare-devil trips into the unknown to chance upon anything worthy of a photo memory! All while wearing 5 layers of clothing in the winter and strapping my best friend around my neck to shoot all the beauty and memoirs I could possibly do on a daily basis! My home was Kenai! A Single Moment Ninilchik, Alaska Surprise! 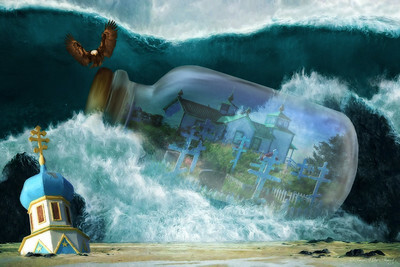 An idea popped into my head when I completed the photo below "Russian Spirits" since there are so many similar pictures take of The Transfiguration of Our Lord Russian Orthodox Church! As I was preparing a painting from my original photo, I began to pull in sections of other pieces of my work to put together an Alaska Fantasy! The next reason to create this painting from my original photos was to enter an online Competition, held by Topaz Labs, creating "double exposure" work. I came in as Honorable Mention!! Digitally Painted from several of my original photos! Surfside Homer, Alaska Have you ever been out with your camera just driving around to find something interesting to shoot? 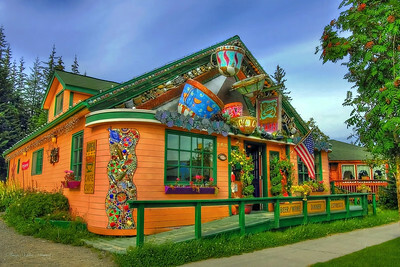 I fell in love with Homer, Alaska the second I drove by the milepost at the Homer Overlook Point; just where it curves around the massive Diamond Ridge Mountain range and drops off to give you an excellent oversee of the artsy harbor town. Each time I took a day trip to Homer, I found more and more lively and amusing spots to take pictures. As I was driving slowly along Ohlson Lane toward Bishops Beach my foot slammed on the brakes at this old abandoned Surfside Shop. It’s well boarded up and overgrown with traditional Alaskan foliage; including plenty of Alaska Fireweed. An exhausted and tired sailboat rests snug at the lot’s corner and boasts a versed native totem pole on the other rim. I was unable to find anyone who had information on its history; and only found tidbits here and there online. It sounds like it’s one of the oldest structures in Homer, possibly built in the 1930’s, where at one time it was utilized as a casket storage building and during a particular iced over winter housed a few bodies until winter ceased in order to dig appropriate graves for them. I believe it’s called “The Ohlson Lane Cabin” but cannot find any source to detail why there is a “Surfside” sign at the top! I do know there is a lot of surfing that takes place in Kachemak Bay, so I assume someone at one time had opened a small little surf shop for a season or two. Feel free to comment if you have any more info! I am always intrigued with these sort of older stories! Digitally Painted from my original photo! What Dreams May Come Skilak Lake ~ Alaska While living in Alaska I often had the pleasure of spending time with my nephews by taking them on picnics, to parks and trails and exploring together. I had taken this photo of them at Skilak Lake while they were throwing rocks and trying to make them skip. Holding on to the picture and studying it often, time after time, I was never really thrilled with its setting. Recently I decided to play with it along with many other photos I have and created a surreal story where a surprise visitor is entertaining them! 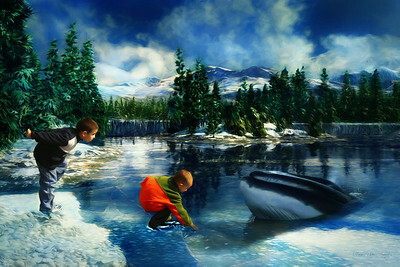 Digitally Painted from my original photos, blended with layers of scenery, ice and more! 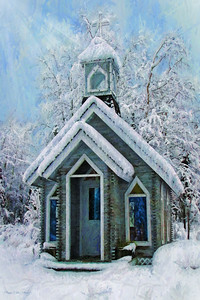 Little House Of God Soldotna, Alaska Dot to dot along Kenai Spur Highway in route of Kenai and Soldotna are spectacles of small and quaint drive-up coffee stands, enticing second hand shops, masses of land for sale, car lots, local businesses and extensive forests to gaze at; just to name a few. I traveled past this petite quizzical chapel which sits alongside the jumbo monolithic domed Trinity Christian Center many times. How many times did I drive past this curious chapel before stopping to take a photograph? Hundreds! To my delight on a snow blizzard day I felt it prompted my senses of living in a winter wonderland and I finally interrupted my shopping agenda to satisfy my urge to take it’s picture! As I peaked through the windows, I noticed only 3 pews with hymn books snuggly tucked in their wooden back pockets and The Bible sitting peacefully on top of the Preacher’s podium. Guessing in building this structure, much of it's 2x2 wooden slats were spared since it has 10 large windows allowing full natural lighting and gleaming sunshine to enhance its inner beauty. Originally it was kept open with 24/7 access to all who wish to seek comfort with God whereby the larger church behind it was only available for normal routine operations and services. They had to start locking it up due to vandalism, but you can always request a convenient time to come pray and enjoy its charm! Digitally Painted from my original photo! Cafe Cups Homer, Alaska What can I say! This quaint café is truly a pleasure to ogle over with its distinguished oversized French coffee cups and enchanting adornments carefully placed within the architect design; including “faces” placed within the eaves along with wine mosaics made from broken crockery. You feel as though you are dining in a fairy tale cottage! And most of all, their curious menu is delightful! 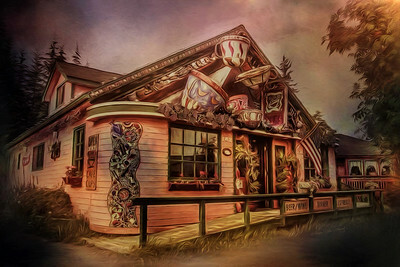 Café Cups is located inside the heart of Homer upwards on a slanted road that spirals and twists. From here you can see The Spit, the glaciers and the islands! Keep traveling up the mountain side for more stunning views of this artsy community and surrounding wonderland! I couldn’t really find much history on Café Cups in my haste to google for details, but I do know the house was built in 1934 and moved to Pioneer Avenue where it was formerly The Homer News and before that was the Homer Women’s Club. When you click the “About Me” section of their website…it’s written in Latin. Hmmm…I guess you just have to visit Café Cups to see how exquisite it truly is yourself! Bon Appetit! Digitally Painted from my original photo! See original next to this one! Cafe Cups (A) Homer, Alaska HDR Processed from my original photo! See my painted surreal photo next to this one along with description and info! 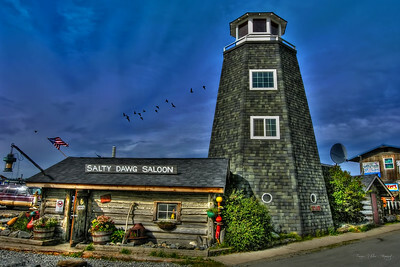 Salty Dawg Saloon (B) Homer, Alaska If you make your way to The Spit and visit The Salty Dawg Saloon, make sure you bring some extra bills to leave behind...not necessarily just for the wait staff and bartenders, but to hang anywhere you dang well please! Money from all over the world is taped, stapled, tacked and stuck all throughout this venue on the ceilings and walls! It’s fun to read the notes and take pictures here! It’s one of the most famous and talked about saloons in Alaska! I love it’s quaint personality, and the beer ain’t bad either! Originally built in 1897 as one of the 1st cabins back when Homer was establishing itself as a town, its multipurpose was a place to buy your groceries, send mail, buy your train ticket and office quarters for the local mining company. A second building was added about 20 years later which became their school. Then, a gentleman named Chuck Abbott acquired the building sometime in the late 40's. At that time it became an office for Standard Oil Company. Lots of changes occurred in the late 50’s for Homer and Mr. Abbott turned the building into The Salty Dawg Saloon in 1957. In 1959 the State Of Alaska became the 49th State Of The Union and a year later State Representative Earl Hillstrand signed the papers to buy it. Four years after “The Good Friday” earthquake of 1964, the structure endured a move to the near-end of The Spit where the enticing lighthouse can be seen best from the waters. Today it’s a must-see and must-do historical landmark! John Warren is the current owner of this establishment.......Lucky Dawg Him! See the original photo processed in HDR next to this one. Digitally Painted from my original photo! 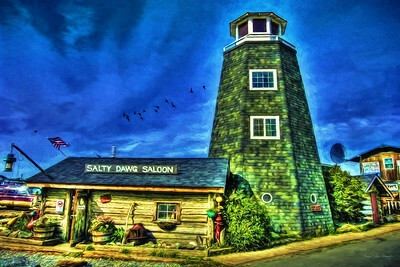 Salty Dawg Saloon (A) Homer, Alaska If you make your way to The Spit and visit The Salty Dawg Saloon, make sure you bring some extra bills to leave behind...not necessarily just for the wait staff and bartenders, but to hang anywhere you dang well please! Money from all over the world is taped, stapled, tacked and stuck all throughout this venue on the ceilings and walls! It’s fun to read the notes and take pictures here! It’s one of the most famous and talked about saloons in Alaska! I love it’s quaint personality, and the beer ain’t bad either! Originally built in 1897 as one of the 1st cabins back when Homer was establishing itself as a town, its multipurpose was a place to buy your groceries, send mail, buy your train ticket and office quarters for the local mining company. A second building was added about 20 years later which became their school. Then, a gentleman named Chuck Abbott acquired the building sometime in the late 40's. At that time it became an office for Standard Oil Company. Lots of changes occurred in the late 50’s for Homer and Mr. Abbott turned the building into The Salty Dawg Saloon in 1957. In 1959 the State Of Alaska became the 49th State Of The Union and a year later State Representative Earl Hillstrand signed the papers to buy it. Four years after “The Good Friday” earthquake of 1964, the structure endured a move to the near-end of The Spit where the enticing lighthouse can be seen best from the waters. Today it’s a must-see and must-do historical landmark! John Warren is the current owner of this establishment.......Lucky Dawg Him! I also created a painted effect to this photo; which is next to this one. HDR Processed from my original photo! 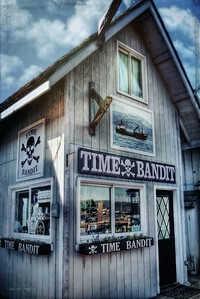 Time Bandit The Spit ~ Homer, Alaska The Discovery Channel produced the reality television show that we all fell in love with; "Deadliest Catch" ! It aired for 9 seasons and was filmed in my favorite town in Alaska: Homer! The filming was amazing and captured much of the local Bering Sea during summer and winter seasons where Andy and Jonathon Hillstrand captain The Time Bandit for crab and much more. If you are lucky you can catch a glimpse of these guys fishing for salmon off the Panhandle Of Alaska all the way to Homer. From time to time you will hear a newscast about it rescuing other ships in distress, too. If you ever saw the show "Deadliet Catch", you would know that it's not all just fun and games fishing in the seasons of Alaska for a living, it can be quite dangerous. Lots of ships sadly sink and many a mariners have lost their lives to these stormy seas. God Speed to our men of the seas. Shops, restaurants, bars and fishing guide venues line up on both sides of The Spit in Homer. The Time Bandit Shop is tiny, tiny, tiny, and yet crowded with folks running in to buy something to remember both Homer and the television show! I took a close up shot since I really wanted to focus on just this shop without distractions around it. 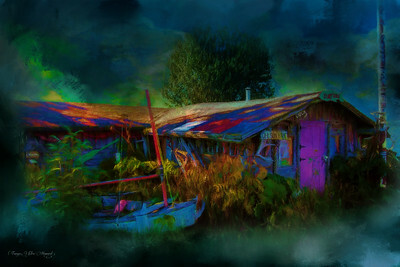 HDR Processing & Digitally Painted from my original photo! 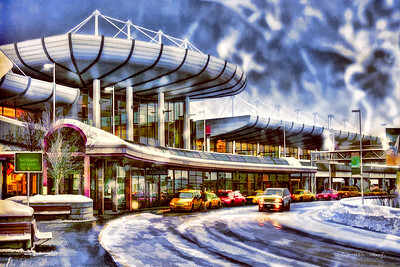 Ted Stevens International Airport Anchorage, Alaska I shot this photo the first time I stepped outside of the Anchorage Airport to hail a cab. My brother-in-law waited for me patiently as I ran up a bit away from the entrance to capture this snowy moment. I knew I had a great first blizzard picture and couldn't wait to get to my laptop to download and play with it! Inside the airport you might feel as though you are visiting an exhibit or museum; if you ever make it out of the bar. You will find statues, paintings, carvings and taxidermy wildlife which includes polar bear, muskoxen and a record sized Kodiak Brown Bear to name a few. I personally don't think anyone leaves this airport without purchasing an Alaska treasure or souvenir of some sort or spending a little extra time visiting the exhibits! You just can't take your beer with ya! My original photo! Ted Stevens International Airport Anchorage Alaska For my Blog, TravelWITWIT, I wanted to have a featured photo that would appeal as a warranted press depiction; anticipating an eye-catching intro. Love how this turned out! The true blizzard shot I took is next to this. Digitally Painted from my original photo! 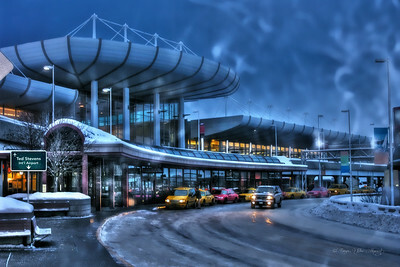 I shot this photo the first time I stepped outside of the Anchorage Airport to hail a cab. My brother-in-law waited for me patiently as I ran up a bit away from the entrance to capture this snowy moment. I knew I had a great first blizzard picture and couldn't wait to get to my laptop to download and play with it! Inside the airport you might feel as though you are visiting an exhibit or museum; if you ever make it out of the bar. You will find statues, paintings, carvings and taxidermy wildlife which includes polar bear, muskoxen and a record sized Kodiak Brown Bear to name a few. I personally don't think anyone leaves this airport without purchasing an Alaska treasure or souvenir of some sort or spending a little extra time visiting the exhibits! You just can't take your beer with ya!